^ Nwigbo Stella and Okechuku Chuks, School of Science Education, Expert system: a catalyst in educational development in Nigeria: "The ability of this system to explain the reasoning process through back-traces (...) provides an additional feature that conventional programming does not handle"
^ Regina Barzilay, Daryl McCullough, Owen Rambow, Jonathan DeCristofaro, Tanya Korelsky, Benoit Lavoie: "A new approach to expert system explanations"
^ a b Cornelius T. Leondes (2002). Expert systems: the technology of knowledge management and decision making for the 21st century. pp. 1–22. ISBN 978-0-12-443880-4. ^ Koch, C.G. ; Isle, B.A. ; Butler, A.W. (1988). “Intelligent user interface for expert systems applied to power plant maintenance and troubleshooting”. IEEE Transactions on Energy Conversion 3 (1): 71–77. doi:10.1109/60.4202. ISSN 08858969. ^ McTear, Michael F. (2002). “Spoken dialogue technology: enabling the conversational user interface”. ACM Computing Surveys 34 (1): 90–169. doi:10.1145/505282.505285. ISSN 03600300. ^ Lowgren, J. (1992). “The Ignatius environment: supporting the design and development of expert-system user interfaces”. IEEE Expert 7 (4): 49–57. doi:10.1109/64.153464. ISSN 0885-9000. ^ Carnegie Mellon University's AI Web Site: "Prolog was the most popular AI language in Japan and probably in Europe"
^ Ivana Berković, Biljana Radulović and Petar Hotomski, University of Novi Sad, 2007, Extensions of Deductive Concept in Logic Programing and Some Applications: "the defects of PROLOG-system: the expansion concerning Horn clauses, escaping negation treatment as definite failure"
^ Dr. Nikolai Bezroukov, Softpanorama: "I think that most people exposed to Prolog remember strongly the initial disappointment. 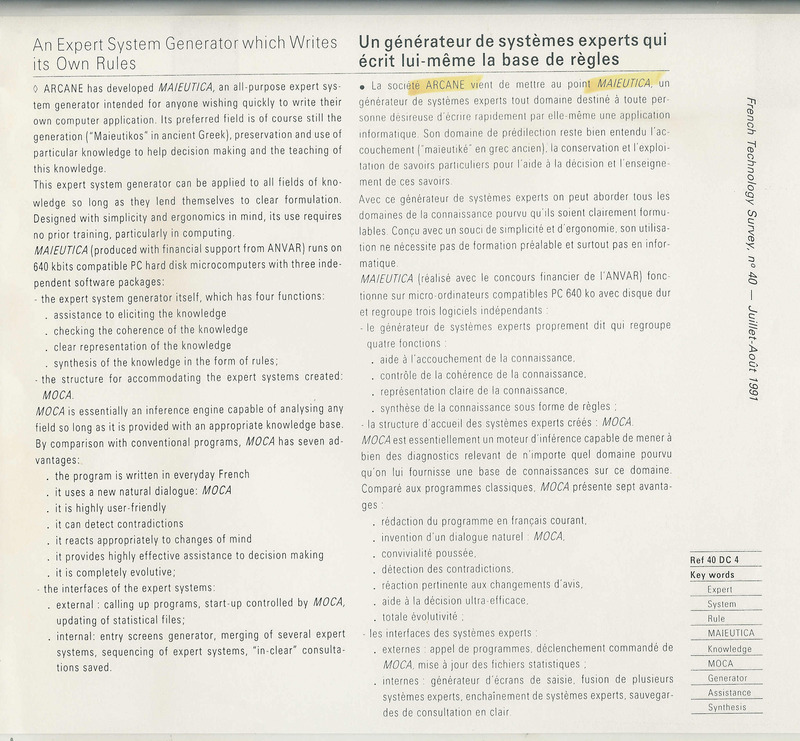 Language was/is so hyped but all you can see initially are pretty trivial examples that are solved by complex, obscure notation that lacks real expressive power: some of simple examples can be expressed no less concisely is many other languages"
^ Systèmes Experts, April 15, 1990, Miao, authentic expert system generator of fault diagnosis: "MIAO can explain, again in [plain] language, all of his logical approach: why he is asking such a question and how it came to such a conclusion. And that because he is constantly reasoning and not because an IT developer programmed in advance all the possible explanations." 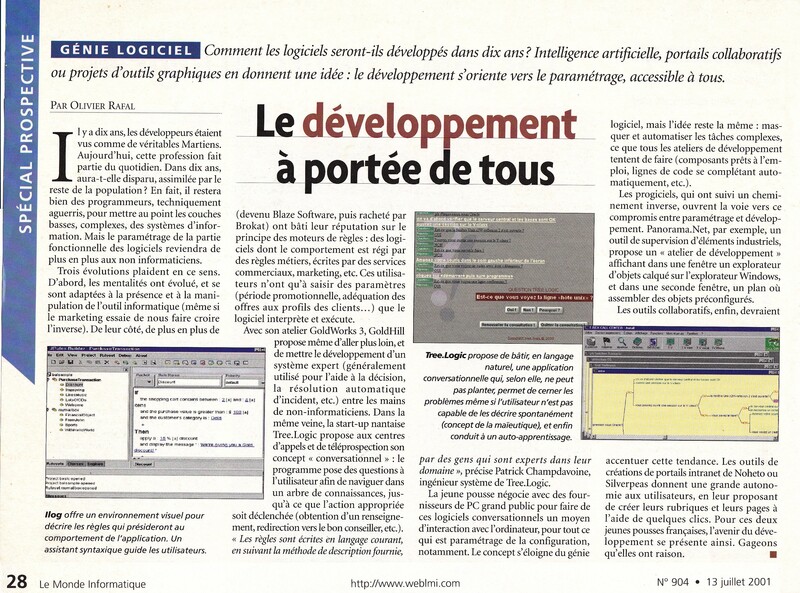 ^ French Technology Survey, MAIEUTICA, An Expert System Generator which writes its own rules, July 1991: "checking the coherence of the knowledge", "it can detect contradictions", "it react appropriately to changes of minds"
Naylor, Chris. (1983). Build your own Expert System. Sigma Technical Press. ISBN 978-0-905-10441-6.